This post is about a meticulously built tiny home, designed to hold up in the long run to mould. The post is written by the owner/builder who did years and years of research and consulted with many building science experts. There was an extreme attention to detail on preventing mould. The main reason almost every house is mouldy is because of the many many mistakes made in most builds (in design and execution). These can be even more prevalent in tiny homes which are less regulated and often built by non-experts. This post is mainly to serve as an example of the care, research, consultation and attention needed to build a house that will hold up to mould. The owner/builder, Terran, also has MCS. There is a focus on healthy materials in this post. This post may have ideas you can use in your own build and it may also be interesting to see the kind of detail needed to carefully build a house. The build itself took over a year. This house uses many practices from Passive House building so there are some unique aspects, but many of these aspects can be applied to most tiny houses. Never simply copy someone else’s building practices without consulting with your own architect or engineer who specializes in mould prevention. If you change the materials due to availability, or your own sensitivities, or you live in a different climate your house will likely be different. We are also not presenting this as the perfect house to copy. Any ideas here should be reviewed by you and your experts. That is not a legal disclaimer, that is just what needs to be done to build a home that will last. Keep in mind even among experts there is disagreement on building systems. However, I do think there are some unique and valuable ideas here. This post does not go over every detail of the build, as that would take a whole book. But it does cover the main tricky areas, as well as the main materials used. Even if you choose just to look at the pictures or watch the video (coming soon - I will post it to my Facebook page), I think this will be interesting to anyone looking to build or renovate, whether you are a beginner who does not know the full complexity of housing systems or an expert in building science. I am very excited about this post. I think it adds something really important to the tiny house conversation. The following is written by Terran and has a few comments inserted by me. It has been edited for grammar and length by me. The owner himself will be away from the internet for the next 3 years, so he will not be available. This post is not sponsored by any of the companies mentioned. I recommend all of the products in the post, some of which have affiliate programs and some of which do not. About three years ago I set out to build a Tiny House to help with chronic health problems I’ve had since childhood. The structure would need to be free of chilling drafts during colder weather (it gets down to around -30 F), free of building materials that caused Toxicant-Induced Loss of Tolerance (TILT), have a good (and properly sized) supply of fresh air in the form of Heat Recovery Ventilation, and would need to be as efficient as possible. Early on we struggled to find materials that would fill these needs. We thought it seemed likely that we would wind up building more or less another version of the kinds of structures that have made life challenging for me in the past. But then a retired contractor mentioned Passive Haus/Passive House (PH) to me. For several months, I’ve been living in the final product of what we built, and it has changed my life. It is by far the most beneficial structure for my health that I’ve ever lived in. Because of that, I really wanted to take the time to explain our build. I’d be really happy to know that others in the Tiny House community might be able to build on what we’ve done, and improve it. They’re awfully small spaces to share with moldy surfaces and cavities of walls, roofs, and floors that have moisture issues over time. I have heard horror stories of how much these factors can impact Tiny House occupants. The envelope design we settled on has a number of points where it differs from other Tiny Houses I’ve seen, so I’ll try to explain why and how it differs in this post. I’ll start with how we went about planning the design. 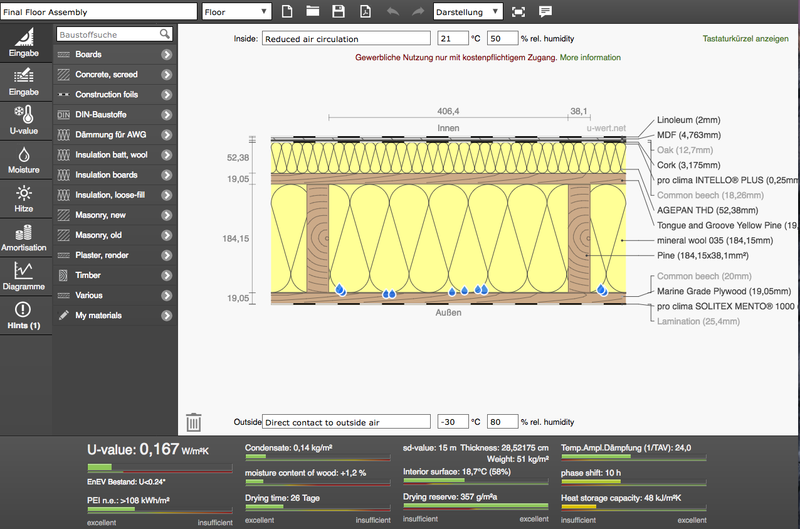 During the early part of the planning phase, the amazing and kind Hans at Pinwheel Structures in Ontario, Canada suggested that I try using U-Wert in order to test moisture and efficiency performance of my wall, roof, and floor assembly ideas. 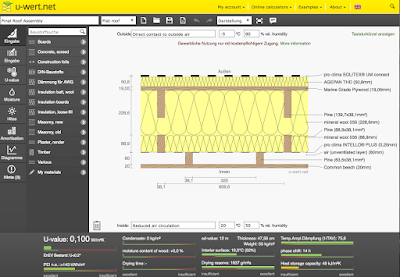 U-Wert (German for “U-Value”) is a program that people can use for free online to perform basic WUFI-style analyses of any given assembly in their building envelope. There are more advanced features available through subscription. The English version of the program itself is still partially in German. 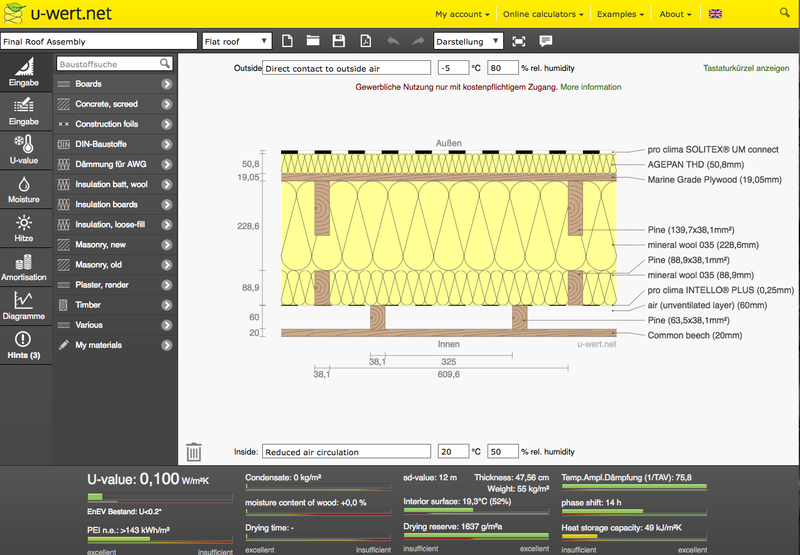 There are full listings of analysis information for nearly all brands and styles of Passive House Certified Materials, as well as a wide selection of the other common building materials. The listings include factors like permeability, u-value, thermal delay, thermal mass, and nearly all the other important statistics for Passive House consideration. Once putting together a given assembly design, one can set interior and exterior temperature and humidity to see how the assembly performs under different conditions. 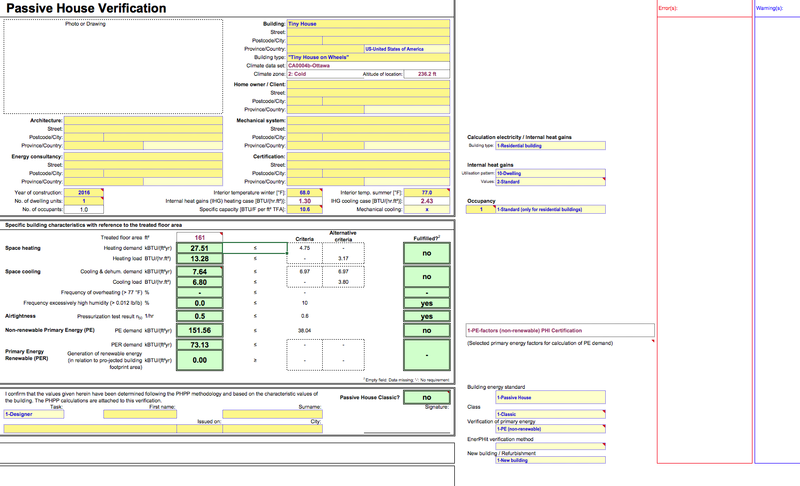 Because I figured I only had one shot at getting our design right, I got a little addicted to the program. 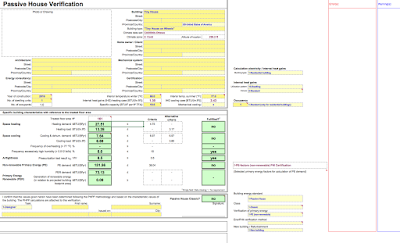 At 475’s recommendation, I also bought a copy of the Passive House Planning Package (PHPP). The PHPP was learnable, with some real attention and effort, for a layperson like myself – and the amount of climate-based information it offered was invaluable for understanding what’s required to build a Passive House. After working with the PHPP for many hours, I was able to get a sense of how much energy I’d be using for the plan I settled on. What I needed was a design that could be potentially mobile, was specifically designed around environmental health issues, and that fit into an incredibly small budget. The home will also be empowered by the fact that it can be physically moved (and therefore re-oriented) each season, to give it the best performance for any particular time of year. After more U-Wert and PHPP test-runs than I could count, we settled on a design that has a few calculated risks, largely for the sake of maximizing foam-free efficiency. I want to be sure to explain those. The first of these risks is that instead of using a continuous layer of exterior insulation, such as Gutex (covered by battens and siding as normally prescribed) we chose to go with Facade-Grade Thermacork. Facade Thermacork has essentially the same u-value as wood-fiber insulation, but can be left exposed to the elements for a lifetime, and is designed and tested to stand up to almost any kind of natural exposure (except woodpeckers…it doesn’t like woodpeckers! Just put up some mylar balloons when it first goes in, and they’ll stay away). This function of Thermacork is not a risk, it’s been relatively well tested in many places around the world and is undergoing some data collection in the temperate rainforest of Washington State. The risk for us is that we could not find anyone who had used Thermacork on a Tiny House and then moved it on the highway. Some of the people we spoke to about the idea seemed completely unworried about the material in highway conditions (after all, it survives extremely high winds on building exteriors all the time). Others felt we might want to plastic-wrap the house if it ever gets moved. We’re thinking we’ll probably be safe and wrap it, just as most conventional mobile homes are wrapped for transportation. This seemed like a reasonable risk to take, as we’re not planning on moving the house often (only once or twice in its lifetime, if needed). Additionally, the Thermacork allowed us to save a great deal of weight over the normal exterior insulation-batten-siding approach – no matter how we sliced or totalled different materials. Thermacork also had a major advantage for sound: one inch of it cancels as much as 50 dB equivalent. Most importantly, though, the Thermacork saved us space. After repeated U-Wert analyses, it became clear how important every inch used for insulation can be in a Tiny House, due to size restrictions. Tiny Houses generally need to be less than 8’6” total width, and less than 13’ 6’ total height for road legal transport in most areas. Additionally, since we were trying our best to make sure that the structure could be certified as a legal residence (we are now nearing receipt of a Certificate of Residence or Occupancy) we had to hit the International Residential Code (IRC) requirement of 7’ interior space in length and height of all habitable areas. These factors place a clear limit on how much space there is in a Tiny Home for insulation. A final note on our framing design: it could be said that we took a risk by utilizing advanced framing techniques for a mobile design. This has become a commonplace approach among Tiny House builders, but it does require care. The architect who volunteered to help us, John at Rebuild Studio, as well as the seasoned framer we consulted with, took every opportunity to emphasize that. We made sure to install metal braces at pretty much every connection point (between floor and wall framing, between roof rafters and sill plates, etc.). Our framing consultant really did want to see us use 2x6’s – rather than the Tiny House standard 2x4’s – and for a lot of reasons (see the “Interior” section on Windows, Doors and Interior) we decided to go with that suggestion. Here are more pictures of the framing. This leads me to the second risk we took: an R-60-ish roof full of Roxul. If we had anyone nearby who could do dense-pack cellulose affordably (or there was a machine we could rent nearby to do it affordably ourselves), I would have insulated the roof with cellulose to be sure we got the weight balance right. Aside from the sheer lightness of cellulose, dense-packing cellulose or fiberglass might have also allowed us to save considerable additional weight by removing some of the secondary stick-framing we put in, in order to add additional layers of Roxul around an interior thermal break space. There are also fantastic cellulose batts on the market, but they would have cost us about twice as much as Roxul (due to the fact that we can easily drive across the border into Canada and buy Roxul near the factory). I want to highlight this risk, because I would not want anyone else to take the same approach we did, only to find that their building is top-heavy and dangerous. I have not taken our Tiny House on the road yet, and so I cannot confirm that it will be functionally balanced. Based on our best weight calculations, and the considerable weight of the floor assembly and heavy-duty trailer we built on, we felt like the building would be alright travelling at moderate speeds. Here on the build site, it has never so much as swayed a millimetre. But I remain agnostic about how this aspect of our build turned out, and we may not know for many years how it will fare on the road. Another aspect of our design that might require some explanation is the floor assembly. We went through a number of ideas for how to create a truly thermally broken Tiny House floor. Along the way, we also had to face the fact that there were no known ways around using vapor-impermeable materials for the interface between the floor frame and the trailer – at least none with proven longevity. I really wanted to be sure that the floor had vapor permeability because I’ve seen deconstructed Tiny House floors that had gone rotten after some years due to impermeability issues. Floors, especially those elevated off the ground and exposed to air and wind, can really have a tendency to deal poorly with vapor drive. They are the coldest assembly in a Tiny House. After some great advice from many professionals, we decided on using ¾” marine-grade plywood for the underside of the floor assembly – with some added tricks and layers. Floor Trick 1: We built the floor upside-down, in sections that we could manipulate without heavy equipment. While the marine-grade ply bottom was exposed, we taped all ply seams with Extoseal Finoc, as well as all parts of the ply that would interface with the trailer. The not only provides a great self-sealing water-proof layer but also enables meaningful amounts of capillary action to wick away any moisture that comes between the floor-frame and the trailer in those interface spots. Floor Trick 2: We then coated the remainder of the exposed marine-grade-ply-surface with Prosoco R-Guard Cat 5, which was extremely impressive. As many Passive House Professionals have pointed out, relying upon liquid-applied layers for air and moisture sealing on walls and roofs can be unreliable. Many such layers can fail over time. Also, they are not produced in a factory (like Solitex Mento or Intello) and are essentially “manufactured” on site. This creates significant added potential for failure/error during application and curing. However, in our case, we were not relying on the Cat 5 for air sealing, since we would be taping all seams by the end of the install. What we wanted was a thick, durable protective layer over the ply surface that would completely repel water, and be moisture permeable from the interior. CAT 5 fit that description very well: it’s thick, water-immune but breathable, and incredibly strong (almost like dolphin skin when wet). Prosoco’s amazing field rep emphasized that Cat 5 should always be covered and protected by rain-screens, etc., as it can definitely be damaged. However, because our application was sheltered and downward facing, and we were not covering the surface with siding or anything of that nature, we felt all the more confident that we would be able to patch the material over time with a brush-stroke or two anywhere it might get damaged during sitting or road-travel. We figured we’d just schedule logical times to check the surface and see if it needs repair (zero repairs needed so far). Although the material should never be exposed directly to the sun and other elements, because we were installing on the underside of a floor-frame and taking the above precautions, Prosoco agreed that this was a feasible approach for our application. Floor Trick 3: After a lot of consideration, we settled on putting the thermal-break layer for the floor to the interior. Placing a thermal break to the exterior of a THOW floor frame either left significant thermal breaks (as in insulating the trailer frame), created a danger of decay (SIPS), or other problems. Placing the continuous layer of insulation inside the building envelope allowed us to not only to ensure we had a robust thermal break but gave us the ability to build our floor sections with 2x8’s (again, without heavy equipment) because we would not need to lift the added weight of wood-fiber insulation board with the sections, during placement on the trailer. Floor Trick 4: The engineer we worked with said that we should use stainless steel bolts and nuts to be sure we had enough strength, and he gave us a pretty large number to install. It was a really fail-proof way to ensure connection to the trailer – and will allow the Tiny House to be removed and put on another trailer or a foundation when this trailer reaches the end of its life. Because our floor frame was so thick, we had to use an extremely long metal drill-bit meant for aircraft, but it was available locally and worked very well (with a lot of elbow grease – Kangaroo Trailers makes a seriously beefy trailer). Dave at Kangaroo was able to get us additional attachment points via welded flanges on the sides of the trailer, and very well-made cross-bars going across the center. His design also saved significant amounts of weight over many of the other approaches we’d seen – while still keeping a maximum amount of strength on the main frame and the tongue. We had been hoping to avoid the use of sheet-goods with formaldehyde of any kind on the interior of the structure, so we used tongue and groove pine instead. Above the pine, we installed the wood-fiber insulation, and above that, we laid Intello Plus and connected it on all junctions with the wall membranes. This very effectively sealed the pine out of the interior living space. However, we were left with a surface that would have been difficult to install a conventional floor over (i.e. the top of wood-fiber insulation, with relative blindness to the studs and tongue & groove below). Floor Trick 4: In the end, after a lot of research, we used Marmoleum Click for our finish floor. Marmoleum makes the only linoleum certified by several international health organizations – and takes great care to ensure that all materials used in their products are low-off-gassing. 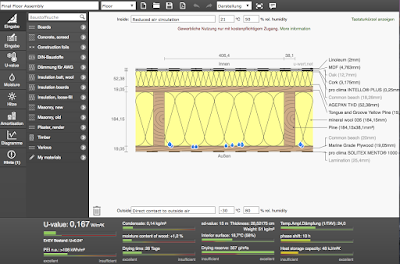 Running a simulation of the product in U-wert (using the top-surface, the low-VOC MDF, and bottom cork layer) tested to have acceptable vapor permeability – although we were never able to get official perm ratings from the company. More pictures of the flooring process here. Because we wanted to avoid drafts, foster dry wall cavities, avoid the formation of mold throughout, and have good control over the interior air-quality of our Tiny House, air-sealing and ventilation were incredibly important to us. We were extremely happy to find products that worked perfectly for these purposes and had extremely rigorous testing and research backing them. We used a carefully detailed continuous layer of Solitex Mento 1000 as our primary exterior air-sealing layer, and vapor-permeable secondary Weather Resistant Barrier (WRB). We applied a similarly detailed interior layer of Pro Clima’s Intello Plus as our interior air-sealing layer and intelligent vapor control layer. We then applied Tescon Profil tape for all our window connections to the interior and exterior membranes (taking care to seal and connect the junctions between Mento and Intello). We also used Tescon Vana to seal the seams of the exterior sheathing as a back-up, to help ensure we got a good air-seal – since it was our first time around the air-sealing-block. 475 believes in redundancy, and although taping all plywood seams below a layer of Solitex Mento is not a step they suggest, we really wanted to be sure we got a proper air seal, regardless of any novice mistakes. Along the way, we sealed all seams and penetrations of the interior and exterior membranes with Tescon Vana as well. Extoseal Encors was used for all the window and door sill-pan details. Encors is able to flex and shape itself around corners in ways that are genuinely unbelievable, especially when compared to normal materials – and its self-sealing and waterproofing capabilities are essentially superpowers. Install Wood-Fiber Insulation properly over the roof sheathing. Properly stretch, mechanically fasten, and tape the Solitex UM over the wood-fiber insulation. 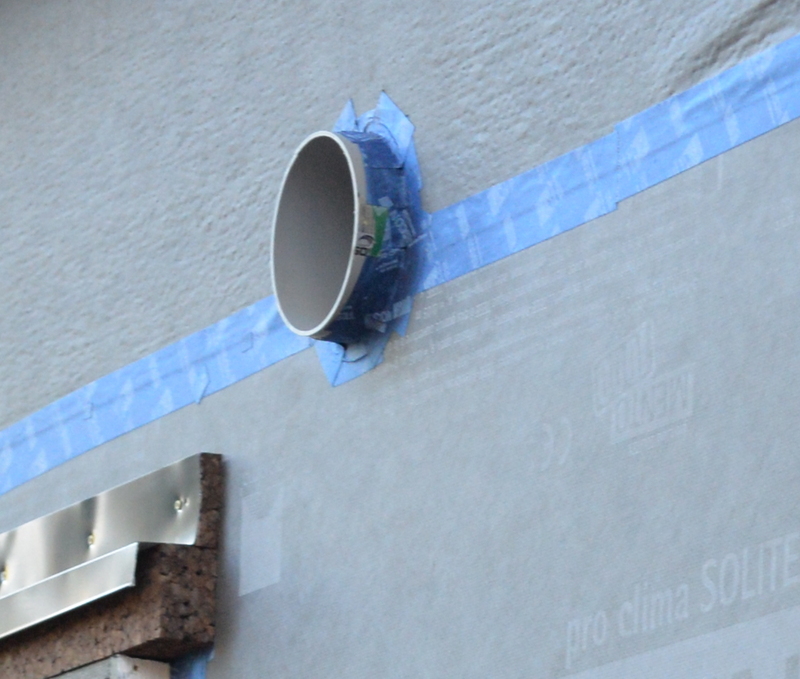 Make sure to properly connect the Solitex UM (or plan so that you can connect it later) to the air-sealing layer over the walls. Be sure that you are placing the edge of the mesh so that it allows water to drip properly over the edge of your roof, and not down behind any part of your wall. Integrate the fabric part of your Solitex UM properly with your wall’s air and weather barriers so that there are no gaps. Each time you fasten any material through the Solitex UM, cut a small slit in the mesh layer above the fabric, to be sure that your fastener doesn’t catch a strand of the mesh, and leave a pathway for moisture to travel along the fastener, and below your fabric. As you place the roof panels, fasten them through backer plates to ensure that the fasteners do not damage or puncture your insulation board. A final note on Solitex UM: If you’d like to experiment with saving wall space, you can also use this on the exterior of your walls, instead of battens, and apply your siding directly on top of it. Here are some detailed pictures of the roof install. The final piece of the ventilation picture was a 24” recirculation range by Summit (Note from Corinne, I prefer for this to vent the humidity to outside like this one). It’s the only model we found that was small enough for us, and in our price range, and it does the job well enough. I had to remove their foam filter (which was supposed to be what caught non-oil food-particulate, but was shockingly diffuse, and wasn’t even cut to the right size) and replace it with cut-to-fit carbon. I was happier with the carbon than a cheap foam filter anyway. Overall, the quality is a bit lower than I had hoped, and it doesn’t effectively catch all the cooking vapors, but with our mini-split circulating air (see the next section for more information) an E.L. Foust 160R2 air-purifier, and the Lunos units running, I’m able to get the air fresh within a reasonably short amount of time after cooking. I’ve lived in tiny houses before that became very moldy as a result of not being able to effectively vent and/or filter the steam from cooking – and the food particulate within it that creates the odors. For heating, we decided on an LG Artcool Premier mini-split heat pump, which is LG’s highest efficiency model. Mitsubishi makes the lowest BTU output model on the market at 6,000 BTU’s, and their models have fantastic quality and durability. I have relatives who’ve owned their units for years now and have also made many calls to local HVAC companies, as well as Mitsubishi and Ecomfort’s customer service staff. All the agents I spoke with were very candid about the different brands and models. Given all of that, as far as well could tell from initial research, the smallest Mitsubishi unit seemed like the best for tiny spaces. So why did we choose the LG Artcool Premier? It turns out that even though the smallest LG Artcool Premier model puts out 9,000 BTU, the inverter LG uses allows the unit to step down heat output to just a bit less than the Mitsubishi Unit (at least at the time of my research, that is what both companies confirmed for me, when I contacted them about the numbers). This actually put the LG unit closer to the number the PHPP gave for the total BTU’s we’d need to heat our house (PHPP will tell you exactly how large your heater needs to be, among many, many other useful things). So in this case, the LG unit will be able to almost match its output to our exact needs, under any circumstance. As it turned out, the small amount of research I’ve seen from the Department of Energy indicates that having units be oversized for the space and unable to step down to the given needs, is a major factor decreasing efficiency. Another factor is that the Mitsubishi unit automatically shuts off at around -13 F according to the submittal. The LG unit does not have an automatic shut-off. Field reports from users as well as the company would indicate that it can continue to put out enough heat to heat a tiny space like ours down to as low as -20 F. So in the end, the fact that our unit puts out 9,000 BTU is not a problem due to the inverter flexibility, and the extra BTU capacity also gives us some extra breathing room to keep using the unit as temperatures drop into negative digits. One final note about mini-splits: our installer seemed short on time, and insisted that he wanted to put the indoor unit on the same wall as the exterior compressor. This is not what we had previously planned on, and came as a surprise. Unfortunately, this meant that it was not only right over the foot of the bed, but would be somewhat obstructed by the only cabinet we had installed. The location worked out fine, and it heats the space wonderfully regardless. However, I hope that if you’re thinking of getting a mini split for your Tiny House, you might be able to account for putting it in the spot that will be most straight-forward for the installer (and least expensive for you). By having the lines from the indoor unit come straight out the wall above the outdoor unit, we saved him an immense amount of time on working with the copper lines, etc..
Windows, for a Tiny House on Wheels (THOW), were items that we had to research and reflect a great deal on. There are many different standards for what counts as “high performance” windows, depending on who you’re talking with. For a certain section of the market, Marvin and Andersen are considered high performance and efficient. We’d had experience with them in the past, and although we were pleased with the workmanship and quality of service, they always became drafty in our region and could be frigid to sleep near. In sections of the truly high-performance market, we found triple and quad-pane windows that were of incredible quality, but also way outside of our weight allowance and budget. Luckily, we found that there is a small section of the Passive Haus and high-performance market that has been working with Heat Mirror technology – which is essentially a special kind of heat retentive film used in place or ordinary sheets of glass. It is cost-effective and comes close to being in the same range of efficiency as panes of glass. However, after speaking with some fantastic (and very honest) engineers at companies with some experience in Heat Mirror use, it sounded like most of them hadn’t really figured out how to make the technology reliable in the long-term. Right around then is when we were referred to Alpen High Performance Windows. Alpen (formerly Serious Windows) has arguably more experience with Heat Mirror technology than any other company in the industry. They’ve learned how to secure and seal the Heat Mirror film properly, as well as suspend the film so that it does not sag or cause distortion over time. They’re accustomed to using Heat Mirrors between glass of varying thicknesses and types, for all applications – and they do so for both triple and quad-pane units. This saves enormous amounts of weight. Their manufacturing takes place in-house at their factory in Colorado – so they are able to have excellent levels of quality control over both the process and the product. After a lot of pricing and research, I honestly cannot recommend any other company for high-performance windows to be used in THOWs. They were also able to work with me to eliminate PVC from the windows I bought (replacing PVC glass stops with aluminum ones – the rest of their windows are made from an amazing low-toxicity fiberglass). I found the PVC used in many PH windows to be a major problem in a tiny space, and many companies unavoidably include PVC and do not offer any flexibility to allow you to eliminate it. All of the people I spoke with at Alpen were wonderfully kind, and either had the information I was looking for or readily put me in touch with someone who did. If you’re looking for PH Certified Windows that will fit into the weight constraints, efficiency standards, and budget for a Tiny House, I just can’t imagine buying anything else. For those who are very sensitive to off-gassing VOCs from window seals, there will be some of that with Alpen windows – as with any window. People like us just need to plan some time in for things of that nature to off-gas before moving in. It didn’t take long before they were fine for me. I’ve never felt uncomfortable in front of one, even in -20 F weather – and I haven’t yet seen even a speck of condensation on them (although the space has been extremely dry during the winter much of the time, often sub 30% humidity). Here are more photos of the window install. Researching high-performance doors for a tiny space was similarly challenging. Again, weight was an issue for the extremely high-quality PH certified doors I saw – we just wouldn’t have been able to balance it properly, or account for it in the overall weight budget. They were also incredibly expensive and outside our financial budget. Due to a recommendation from Alpen, and other folks we spoke with, we began looking into local ProVia dealers. They make high quality, well-crafted steel and fiberglass doors with R-values around 5, solid air-sealing values, and options for quality multi-point locks. Just about a year before we contacted them, ProVia began manufacturing what they’re calling the “Embarq Door.” They claim that it’s the highest R-value unit on the US market, and many reps at their company seem to consider it to be the ultimate in high-performance entryways. Although I feel someone at the company should inform these employees that there is an entire world of PH doors out there – many of which blow the Embarq away in pretty much every category. I hope more people get a chance to look into it and see if it’s a good fit for their project. It has some improvements to make, but it’s a very high-quality American made door, for a decent price (depending on where and how you buy it). The Embarq door is R10. ProVia built it more or less like a vault-door: with a tapered interior edge Based on our research into door options, it came in at between ½ and ¾ the cost of a certified PH door, depending on the given model and quote. The Embarq makes use of ProVia’s impressive Signet fiberglass technology – which is not only light but can also imitate a number of different wood grains, to the point of being almost indistinguishable from wood from six feet away. On the downside, ProVia hasn’t yet figured out how to use multi-point technology in the door (due to the vastly increased thickness over their standard doors). Because of this factor, and the fact that they're still tuning their manufacturing process for such a thick slab, the air-sealing figures suffer a bit compared to their normal doors – despite the multiple layers of seals they use. They seem to be figuring out the manufacturing process and how to work around the slab thickness and seals, which can make for tricky installs – especially if you’ve ordered a wide-jamb door, as we did. For our interior bathroom door, we picked up a free slab with hinges from Craigslist. I apologize to those who were hoping for something prettier! On the interior of our envelope, after much debate and reflection, we decided to go without a service cavity in the walls. This is not a choice that we made lightly, and I wish we’d been able to include one. Because we had the space, we were able to use a service cavity in the ceiling – and we packed as much electrical into that as we could, and fit 100% of the plumbing into the interior bathroom and countertop space. For what little wiring was left over in the exterior walls, we settled on surface-mounted outlets which allowed us to avoid large holes in the membrane. Air-sealing a Romex cable is pretty straight-forward with Tescon Vana and it saves a lot more air-leak risks than a larger hole. We did use one air-sealing outlet-box from 475, and it was awesome (i.e., sleek, space-saving, easy, effective, etc.). If I had the chance to go back to the electrical phase, I’d just use the air-sealing boxes everywhere instead of the surface mounts. If I had a chance to do the whole project all over again, I would want to do a full-on service cavity in the walls. Here are more pictures of the electrical. Using a service cavity is the best way to assure a fully intact and functional interior membrane, and it just makes everything in the finish phase more straight-forward. In our case, we would have either had to trade the 2x6’s we used (to increase structure and insulation) for the service cavity space, or make the interior an illegal living space by making it smaller than 7’, side to side. We made the best choice we could at the time, and I was very focused on trying my best to get as efficient and moisture-sound as we possibly could. 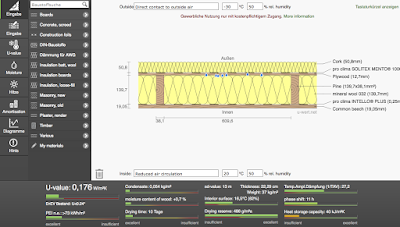 As an additional note on where I was coming from, no matter how I configured it, U-Wert consistently showed us significantly better efficiency and moisture numbers for a 2x6 wall cavity with 2” of exterior insulation, than with 2” of exterior insulation, 2x4’s and a 1.5” service cavity. I don’t know if this was just a glitch in U-Wert, but especially the moisture performance calculated as clearly superior, even when using a 2.5” service cavity. I think this might be due to the fact that the inboard membrane had all of the insulation to the exterior of it so that the total amount of wall insulation was not broken up by a second set of framing members, and the membrane. U-Wert also showed a clear improvement in moisture performance when the service cavity was left un-insulated, so I imagine that the additional insulation on top of the Intello created more of a temperature difference between the inside air and the Intello’s interior surface, which made for greater condensation risk there in the winter. I hope those who are much more in the know than myself, and with expertise in WUFI, will chime in with their thoughts. Obviously, both wall cavity sizes are far, far smaller than any truly Passive House in the Northeast. 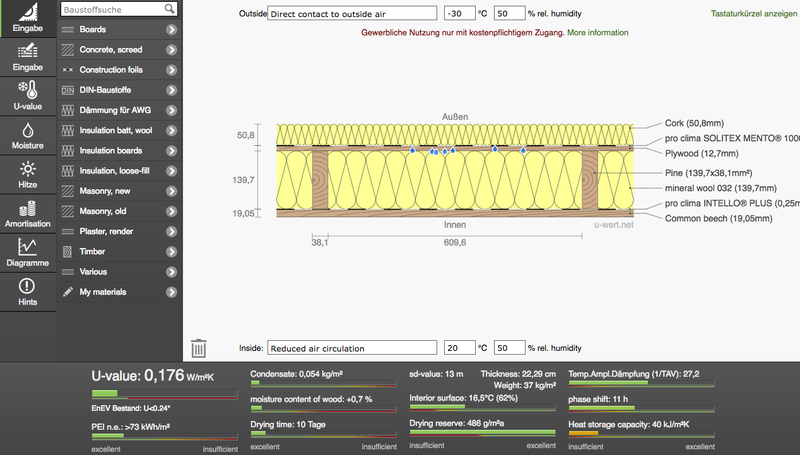 Based on my tinkering with U-Wert, I do not imagine anyone with a Passive House in this region would see moisture dynamics of that kind in their assemblies, due to the much larger amount of insulation exterior to the Intello. The U-Wert analyses certainly support that idea – and I can see that principle at work in how the numbers for our roof assembly worked out. Because of the greater amount of insulation exterior to the Intello membrane, we could have easily insulated the service cavity without much condensation risk. However, given that we wanted to squeeze as much insulation into the walls as we could, we just couldn’t see making wall service cavities and not insulating them. To moderate the risk we faced by not using a service cavity on the walls, we worked with John Kingsley, at Kingsley Woodworking in Ithaca NY, to come up with a creative approach. John was the only person we found who could mill us ½” Poplar T&G panelling (or ½ panelling in any wood species). He did a beautiful job milling and sanding it. Because John knew we were trying to save weight, he mentioned to us that he could remove a small rectangular portion of wood from the back of the panelling, without compromising the structural integrity. He calculated that this would save us quite a significant amount of weight over the whole structure. Once we saw the kind of thing he was talking about, we also felt like the extra space behind our panelling might provide a least a little bit of additional room for moisture and air exchange, which helped us feel a bit better about not having a service cavity. Because we knew at least some of the panelling would have to be in direct contact with the Intello during its least permeable mode, we made sure to paint all four sides of the panelling boards with highly permeable Romabio mineral paint. Romabio felt that the paint did a good job of protecting wood from liquid moisture, while at the same time remaining vapor open. We won’t know whether this approach worked until some years have passed, or we cut a panelling sample to see what it looks like on the underside. We look forward to seeing what the results are though. There were a lot of approaches we took with the interior, in order to try to maximize the efficiency of the space or minimize weight while maintaining high-quality. Eco Supply Center, which was the source of our Facade-Grade Thermacork, also very kindly walked us through the process of buying and DIY-ing Richlite for our countertop. Richlite was by far the best material we found for this purpose, after a lot of searching and ordering samples. Richlite is 0 VOC, waterproof, far more durable than wood, and weighs a tiny fraction of stone or other high-quality non-paper-based solid-surface options. Cutting and installing it ourselves was a little daunting, but between the amazing assistance from folks at Richlite, and the great people at Eco Supply Center, we were able to do it (at least to our standards!). In the end, we were able to use a totally normal saw blade for the cuts, but it did need to be high-quality, and sharp – at least in the beginning. After making our cuts, the Richlite dulled our blades to the point of them being basically useless. We certainly took that as a testament to how robust the material is, and it was great to be able to DIY it since most other non-wood countertop materials must be cut with professional equipment. The folks at Stiebel Eltron were an incredible resource for water heating. I searched an awful lot for a hot-water heater that would allow us to avoid plumbing propane (and re-filling propane tanks) and would give us on-demand levels of efficiency for the small amount of hot water I needed. All the on-demand electric water heaters I found required much more amperage than we would be able to run to the THOW, even the amazing range of on-demand units that Stiebel Eltron makes (their lower-flow, lower-power sink units just weren’t designed to put out enough water for showering). After using an incredibly effective little 6-gallon water heater in India, I started looking into similar options on the US-market but found them to be generally unreliable based on reviews. They were disappointingly inefficient. They were also not built for long-term serviceability and became trash as soon as most anything needed to be replaced. Stiebel Eltron makes by far the most efficient small-tank water-heaters on the market, and during my search, they released their 6-gallon model. It is serviceable across the board, and replacement parts are available through Stiebel Eltron for anything you might need. In my experience, with a low-flow shower head from Niagra I can have all the water I need to take a more-or-less normal (though by no means long) shower, so long as I make sure the tank is up to temperature before I start. It takes some care and practice playing with the hot and cold, and my preference is to keep the tank temperature right about 115 through most of the day, then turn it all the way up before taking a shower, and wait for it to get up to temperature before jumping in (there is a light on the side of the unit so you can tell when it’s running, and when it’s up to temperature). The unit has been extremely quiet and draws 1300 watts when in use (according to the literature, it has around ½ KW standby usage per day, at 120 F, if you leave it on all the time). That was low enough to fit within the bounds of the underground electrical service we were able to run to the house, and I am extremely grateful for that. Along with an induction cook-top, and the previously discussed heat-pump mini-split, everything fit just fine into a 50 amp service. With some care, we could run the house on an extension cord in the future if needed – and we’re now all set to run on renewables like solar, if I ever have the money for them. After talking with a number of people in the industry, it seems like with decent sun exposure, we would need very, very little in the way of a solar array to off-set the entire foot-print of the THOW. And here is one last album with general construction details! I hope that we might have shared something here – either through the text, video, or pictures – that will be helpful to others. There are so many good intentions in the Tiny House community, and I worry that far too many people wind up with spaces that fall short of what they expected in terms of comfort, health, and efficiency. I’ve been inspired by folks who broke out of the main-stream to experiment with addressing those problems – like Robert and Samantha at Shedsistence, and Leaf House in Canada. I hope we can all work together to make tiny structures live up to their potential, and become healthy, comfortable, efficient, affordable, and legal spaces for people to live. Disclaimer: As an Amazon Associate I earn from qualifying purchases through the Amazon links. This is a great pile of information! Can you elaborate on how the cork exterior saved width? As an exterior application (as opposed to something in between your studs), it seems like it would ADD width issues. Also, we'd love to hear more about how the cork performed over time! I will try and answer for Terran since he's not online for a few years. That space on the outside would normally be a rainscreen and siding but instead they were able to add I'm guessing R-8 in the facade instead, in addition to the probably R-24 in the walls. Thermacork, the one used here does not contain glue. Cork floors are a whole nother ballgame! The object of this build was not to built with just natural materials. The goal was a mold preventative house that was tolerable for the owner. The marmoleum click was the hardest part to offgas, it's more difficult than the marmoleum rolls. But the rolls still have an odour which is natural but not necessarily tolerable.